A really, really good — if strangely overlooked — live jazz fusion album, comparable to Cannonball Adderly‘s The Black Messiah and Donald Byrd‘s Ethiopian Knights, which is to say this is not formally or stylistically innovative but everybody involved delivers superb performances with a focus on warmth and heart. 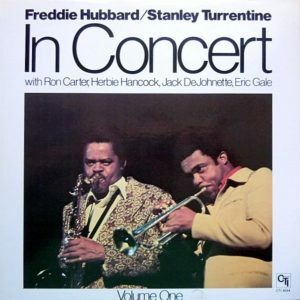 There also is an equally good Volume Two, on which Herbie Hancock shares top billing — strangely, because he plays on both volumes, but also not so strangely given the commonalities this music shares with his own Mwandishi group. As fusion was starting to drift into bland mediocrity, this is something else entirely, a vibrant, energetic and likable rock-inflected electric jazz performance that sidesteps the sort of pandering that usually goes hand-in-hand with fusion from this point onward. There are overt signs of structure, and efforts to make the performances sound proper and professional, but there is always a hint of something unruly and dangerous lurking behind every note. It is that sense of double meaning that makes this more than just a funky good time (which it also is).